How Bourgeois: A Gray Hair Update! This post contains Amazon affiliate links. For a full explanation, please see my complete disclosure HERE. Thank you so much!!! Hi silvery-haired friends! I know that it's been "long-time-no-see" over here in the How Bourgeois house. We're just chugging along, trying to get the school year rhythm off to a good start, and enjoying the warmth and sun while it lasts. In fact, as I write this, there is the cubbiest, most adorable ball of a chipmunk, sunning himself on my patio. I just want to hug him, he's so cute! He must know that colder days are coming sooner or later to Michigan. In addition to homeschooling, we've had a few outings and a trip to see the fall colors up north. We just had the exterior of our house painted and I've made some decorations to go with the festive new paint, but more about of all that another time. Today, instead of apple orchards and crockpot recipes, I'm here to talk about GRAY HAIR! Woo hoo! You guys have been doing such a wonderful job of bravely going forth with your gray hair plans. I've been receiving the most beautiful, inspiring updates from so many of you. They remind me all of the time of how quickly the"grow-out" phase becomes a memory in the past. I know for those of you in the early stages, it might seem that your new hair grows at a snail's pace. Rest assured though, I PROMISE , once you get past the "skunk Stripe Slump," it just gets EASIER and FASTER! Soon you'll feel more like YOU again, and you'll go about your days barely even thinking about your hair color anymore. I'm wanted to pop in and share my own gray hair update with you. This is especially because I think I've finally found my groove for keeping this silvery mop of mine in good shape. There's been lots of trial and error and experimentation with products, and now I've got my routine down. This is the flatter, non-poofy version of my hair, but some days I leave it fluffier and add in waves hot rollers. My hair is still pretty short from the haircut that I had in the beginning of summer. I've decided to grow it out again, but the cut was well worth it to get my yellowed ends off. I regret, as I do every time, deciding to cut bangs! Those will be grown out too. I'm envious of women who can effortlessly wear bangs and look great in them. I feel on me, they're just not my best look. So here's the scoop - Joico's Color Endure Violet Shampoo and Conditioner has been a total GAME CHANGER for me!!!! Not only has the giant 33.8 oz bottles lasted me for FOUR MONTHS, but this sulfate and paraben-free duo has made my hair softer and brighter than it has ever been! I promise, this is my true and honest opinion. I haven't been gifted these products or asked to review them. They've helped my hair to stay whiter and full of light, and I wanted to hopefully help you too! If you are someone who struggles with brassy tones and dullness in your gray, like I do, Joico can really help. I've tried so many "purple" shampoos and conditioners, and this one has worked better for me than any other has. I've found the conditioner to be moisturizing enough for my hair type, and it does a nice job with frizz and tangles. The only draw-back that I've seen in the past four months is that sometimes, IF I leave the shampoo on for too long while in the shower, my hair takes on a slight purple cast until the next time I wash my hair. This can be easily remedied by simply leaving the shampoo on for a minute or two instead of longer, or using a clarifying shampoo. You can find a clarifying shampoo at any local drugstore. I use one from Pantene once in a while. All-in-all though, Joyce's violet shampoo and conditioner is absolutely worth it and definitely effective! Not to mention, I LOVE not having to go out and buy shampoo and conditioner very often. The 33 oz. bottles are great! (By the way, for those of you who are unsure, you can also purchase each in smaller size bottles.) Beyond all that, this shampoo and conditioner is sulfate-free and paraben-free, which is not super easy to find. That's the hair update! I hope all my Silver Sisters are doing well and enjoying this favorite, lovely month of mine. More again soon! Helooo! 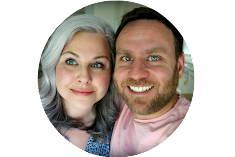 I happened upon your blog while searching help tips for dealing with my graying hair; I began graying at 18. I recently have undergone a multiple process to "Silver Balyage" my hair in attempt to embrace my Silvering crown. I tried the Fanci-full Brand "silver lining" rinse Toner, and it rubs off on everything, and makes my hair feel rough. Even that doesn't seem to work too well. I saw your post regarding the Joico color endure violet Shampoo-Conditioner combo, but I am hesitant to invest in it until I'm sure it will give me the results I desire. Should I go back to my colorist and see if she can fix the problem? All I want is for my hair to blend to my silver/gray roots all over my crown. Any thoughts? That haircut looks so cute and your silver looks nice and "cool." I have that Joico shampoo too and it's great. I'm only 8 months into growing out my gray. I can't wait until it's all grown out. I probably have at least another 6-9 months. Thanks for the update. Your older posts helped me a lot a year ago when I was psyching myself up to stop dying. Awww Cozmic, I'm so sorry, that can't be easy. I hope you find a way to make your hair the way you would love it soon! (Btw-it's gorgeous!!!) I apologize because I don't have any personal experience with lifting my hair color. I grew out my gray and did not color it or highlight it because I wanted to stay away from dyes for a number of reasons. The Joico shampoo is really just that...a shampoo and not a dye, color or tint. The purple does help to "tone" brassy, yellow hair into more white hair, but I am not sure if it will take away all of your oxidation completely. I would bet though.....it would help! I love the shampoo and conditioner and I do think it would help, but perhaps a visit back to your salon would help the most. Thank you so much for your comment. Let us know how you are doing, my fingers are crossed for you! I absolutely love your hair and think you look beautiful. I've been thinking of growing mine out for some time but dreading it too. You've inspired me! The roots are already showing and winter hat season is here. I'm just gonna let it grow out. Thank you so much for sharing your journey. In the two years after that I had gotten even more grays...(wish I had done a "Before Pic") But, anyway...What has been done, is done. I have been getting gray strand, by strand, over the years; Although I have a couple of thicker streaks around my face. When the colorist lifted the color out, she piled my long hair on top of my head. The bleach bled onto my natural roots. In a second process, she had to re-paint on darker color to cover the areas accidentally lightened. :( I ended up will my whole head colored. So now, the growing out begins ALL OVER AGAIN! I spent cumulatively 10 hours in the chair, and probably $600 or more on this "mistake". Should I find another colorist that has more experience with this sort of thing? Or, should I keep going back to my original colorist until it is somehow fixed?...I don't know. I am due for a Keratin Treatment/Trim this Month. I'm so sad about this, because I knew full well the risks. 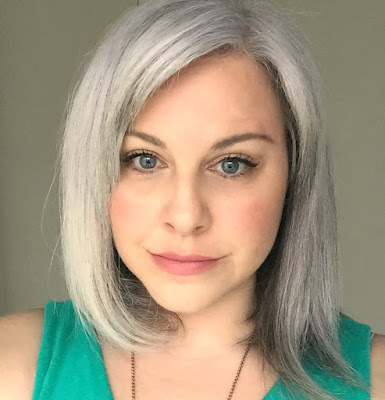 Hey, just wanted to let you know that I find your blog incredibly inspiring, and it's helped me enormously in having the courage to grow out my gray/white hair. I'm around your age, and I got my first gray at about age 12. I started dyeing my hair in my early 20s (mostly due to social pressure). So far I have just over 3 inches grown out, and as the kids say, the struggle is real. Especially where I live, which is a very looks-conscious (read: superficial) urban area. On top of that, I work in the corporate world, so I am under pressure to look so-called "professional." So far I've been creative with headbands and temporary cover-ups, but soon I will have to "come out" so to speak. So I'm preparing myself mentally for that. It's funny how taboo my decision seems to be--for one thing, I have never seen a gray-haired woman in my industry (and I've worked in it for quite some time). Plus, in general, in my town, it seems to be almost an unwritten rule that women have to wait until at least 60 to grow out their gray. Question for you: Do you get stared at by strangers? Do you find having gray hair makes it hard for you to blend in and just be a "woman on the street"? And if so, how do you deal with that? I find that on the rare occasions I have gone out with my white hair showing (no matter what the style), I get stared at. Being the sort of person who would much rather just blend in, I really don't like that! I know I will have to get used to it, and that it ultimately doesn't really matter. But it feels almost as if by choosing to do this, I am permanently giving up the ability to be an ordinary, anonymous citizen as I go about my day. (And I've always really valued that ability.) Of course at some point I will enter the demographic where it will be considered normal for me to have gray hair, so there's that. That said, it's amazing (and pretty sad) how much power the concept of "normal" can have over us! Anyway, thank you so much for your encouragement, tips, and general positivity about gray hair. Your honest and compassionate discussion of this fraught topic means a lot to me and, I'm sure, many other women. And by the way, your hair is absolutely gorgeous! I'm so sorry. I can hear the frustration in your words. I know it will work out and be ok in the end, and your hair, even now with not quite the right color, is GORGEOUS!!! This is my two-cents....personally, I wouldn't go back to your old stylist and I probably would not visit someone new either. When I decided to grow out my gray, I went cold turkey because of an allergy to hair dye, an uneasiness about the chemicals and all the time and money I have spent in the past. As hard as it was to show the world my "skunk stripe," for a while, I have to tell you, it was SO WORTH IT!!! You need to do what works best for YOU and your hair, and if that means highlights or lowlights or blending, then that's great! I just wanted to share my experience as an option. It is not easy, it was very very difficult, but didn't last too low and had great things at the end. I hope this helps Cozmic. Please let us know how you are doing and how things go. I'm cheering you on and supporting whichever path you take! Thank you so much for your heart-felt comment. It brought me back to several years ago when I was wondering similar things about going out into the world as a "young gray." My heart goes out to you, I know it's never easy. It sounds like you have a few things to consider, like working in the corporate world and being part of an urban environment where going gray early is a no-no. The first thing that came to my mind was to tell you that IF you decide in the end that you're not ready to go gray, that's OK! I'm not saying that you are not ready or anything like that, but if it starts to effect the way your colleagues see you or makes you feel too too self conscious, it's ok to color. Zero judgement! I'm guessing that at 39, I'd still be a brunette if I had not developed such bad allergies to dye. The good news, I know that they never meant it in a bad way, and as time went on, the looks became less and less. After a while, I stopped noticing, AND the great part, the stares began to be replaced by compliments!!! It was crazy, I never thought I'd get compliments but now I do every week. It all works out, I promise! Like you, I wanted to not stick out and yes, at first maybe I did. Now that my hair is grown out, I don't think I stick out as much and it all settled down. I hope this helps you. Know that I'm sending you a hug and lots of good thoughts for an easy grow-out. You can do it Silver Sister!!!! Thank you so much for your wonderful blog and particularly the grey hair posts as they were the ones that led me to you. I am recently 60( I cannot believe it and just typing it seems it cannot be true!) and just in the months before my birthday I made a very sudden decision to stop coloring AND cutting my hair... and wow in these four months since, I had no earthly idea how silver the hair was around my face. I have maybe 1 and 1/2 " plus of new growth. I started coloring about 30 just to liven up my medium mouse brown. My mom did not have a single grey hair on her head until 70 so it was quite a surprise! I read so much about doing low or highlights to transition but to me that was just adding to the problem and the time to grow out. I am so lucky to have found in you someone who did it cold turkey!! I also mostly always had short hair ( pixie length) and have been sick too death of it. Have harbored a fantasy of having long hair and learning to wear it up a la Katherine Hepburn ! I had a 'sneaky' stylist who, when I tried to grow it out before, kept trimming and cutting layers in it so it was never really long enough to get it all up properly... she told me it was 'necessary'! reading your posts on the subject are giving me lots of strength to weather the grown out and your experience and advice on products is invaluable to me. We almost had a homeschooled child as well due to issues of LD which the public school would not deal with but after a cross country move we stumbled on to a very small private school geared to LD issues in our area that was fantastic. But just reading your posts was uplifting as I worried if I had to homeschool my son I could not have did it well. You posts reassure me I could have succeeded! My son took a while to graduate from college but he just did in August with a degree in Classical history and a minor in Latin - something his public school said would be completely impossible! Sorry for the novel length post... ! Thank you so much for your blog and your recent update photo. Lauren - I just discovered your site today. I love all the information you have shared and especially love your hair. I just turned 57 a couple of weeks ago and began growing my gray hair out about 2 years ago. I worked with a wonderful stylist for the first 12 months using low lights and cutting a couple of inches off each time I went in. The slower transition worked well for me. There are those who thought I was crazy for doing this but the freedom I gained was worth it to me. It helped that I have a understanding man who loves how I look with the gray "highlights". I wanted to mention that I also have enjoyed the make-up and clothing information you have shared. I to am a 5 foot hourglass and laughed when you said your waist was your favorite feature as I thought the same for me before reading your answer. Now to go check out some of those sites you listed! It sounds like we have quite a bit in common. I;m so glad that you're here and that you took some time to stop and say "hello." A very happy, be-lated birthday. I hope it was good one!!! Thanks so much my silver sister!!! Hey Anon...I started coloring my hair at 30 and stopped about 8 years ago. My roots were all white and I had to highlight color every 3 weeks. I ran into a friend who was a brunette and here she was with beautiful silver hair. I asked what her secret to growing out was and she said she decided that her hair would just look odd for a year and then it was over, and I thought, "I can do that,too" so I did. I did the "short as you can stand it" haircut which was about ear level for me and was on my way to silverland. Truly the first several months were the hardest in grow out mode...seemed everyone stared at me so I told all that I was growing out my silver hair, and, NO...I hadn't forgotten to color it. About 6 months into the grow out I was having a spa day with my sister and while we were getting pedicures my very young nail girl said, "Do you color your hair?" I said, "well, I color only the last four inches." She couldn't figure that one out but we had a good laugh. I also had a bleach accident when we decided to lighten those last 4 inches....30 minutes under the dryer and the bleach had crept up almost to my scalp!! I, too, had to deal with the bleach on my silver...but we toned it and cut as much off as possible. My journey made me laugh a lot...and my year stretched out to be about 15 months with my bleach accident. Hang in there...it is all worth it!! I just kept a picture of Emmy Lou Harris in my mind!!! New colorist! Why are you getting a keratin treatment? You are adorable and I looooove your hair. Not sure I have the balls to go grey yet. Do you have suggestions for how to start? I'm in need of a root touch up now but just tired of it. My hair is really long and I don't really want to cut it, so I'm not sure there is a graceful way to go grey? Thanks for your blog. You know Lisa, if it hadn't been for my allergy to hair dye, I bet I'd still be a brunette today. I hated the touch-ups too, but for me, it took a real push to grow the gray out. I just want you to know that when the time is right for you, you'll feel ready. Don't push yourself. :) It really is a huge change and commitment, so go easy on yourself, it'll happen if it's meant to, when it's meant to. Your hair looks gorgeous. I have to tell you, I was shocked to find during my grow-out, that my short hair cut upset me much more than even the skunk strip. So, if you feel more like yourself in long hair, I can totally understand your reluctance to cut. As for the grow-out, you are right, there's no super graceful way, but when it's all said and done, the growing out time will just be a memory. Some women have found that highlights and low lights have helped them during this time. 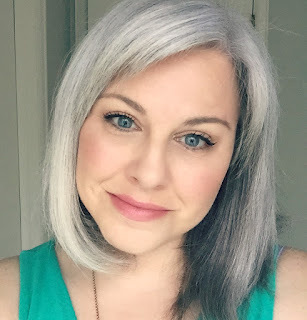 Almost of all the women I have spoken with who stripped their hair and toned it gray did not love it, as the gray color washed out quickly and they were having to touch up all the time. Also, it really damaged some of their hair and for some, they found their hair growing in did not match the gray dye. So, in theory there SHOULD be a graceful way, but in practice, it seems a bit hit-or-miss.